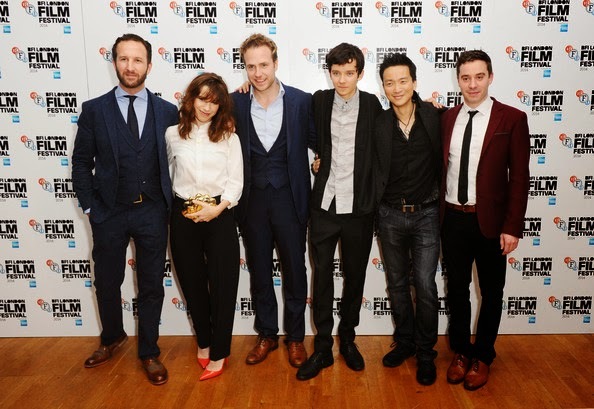 The cast of X+Y at the BFI London Film Festival. X+Y is a spectacularly good film - one that makes you laugh out loud, care deeply about its characters, cry in sympathy, and wonder what happened to them next. That it's a debate feature from director Morgan Matthews and writer James Graham is even more impressive, and I really hope this British indie film gets the release and recognition it deserves. The film is about a young autistic maths prodigy called Nathan who carries the trauma of his father's death in a car accident. His loving mother Julie (Sally Hawkins) manages to get him extra maths tuition with a teacher called Mr Humphreys (Rafe Spall) who was also a maths prodigy but has been beaten down by Multiple Sclerosis and know self-medicates with alcohol and a kind of ruthlessly funny defensive humour. Somehow, Mr Humphreys manages to make a connection with Nathan, and gets him to enter into an international maths olympiad, in which he leaves for a selection camp in Taiwan, meets a girl, and discovers what's truly important to him. The movie is about Nathan for sure, but along the way we get glimpses into the lives of others and there's always a darkness underneath the romance and comedy. Zhang Mei (Jo Yang) seems so light and well-adjusted compared to Nathan but she suffers from familial pressure to perform and accusations of nepotism. Or take Nathan's room-mate Luke (Jake Shelton). At first he's a funny OCD Sheldon Cooper type of a character and its easy to see why he might get on his team-mates might get frustrated with him. But underneath it is a deep and tragic tale of bullying. As for Nathan, the film-makers do a great job of showing how callous he can seem toward his mother without judging him for it - it's more a symptom of his illness. Asa Butterfield is absolutely perfectly cast given his otherworldly blue eyes, his ability to switch from awkwardness to attempts at affection and the occasional wry smile. And Sally Hawkins is, as ever, desperately affecting as the woman who is trying so hard, and gets no reward, and just cannot understand why Nathan's father and even Mr Humphreys get through to him when she can't. But the real star of the show is Rafe Spall as Mr Humphreys. He has an energy and infectious humour that carries us through the first third of the film when he coaches young Nathan. And the film definitely misses him when it moves to Taiwan for its second act. As we move back to the UK for its final act its a relief to see him back on screen. I've been thinking a lot about the depiction of chronic illness and autism on screen since the release of THE THEORY OF EVERYTHING and IMITATION GAME. I think what has annoyed me so much about the former in particular is how the characters are shown to be good and pure and ever suffering and ever smiling. I never felt like I truly understood what it was like to be a carer or in that situation. I never felt the fear or the embarrassment or the frustration. By contrast, with X+Y I felt a real sense of vulnerability and authenticity. The scene where Mr Humphreys attends group therapy was just true and moving in an unpretentious and raw way that self-consciously award-bait film can never get to. Sally Hawkins shows her character's frustration and humiliation in a way that Felicity Jones is never allowed to in THEORY OF EVERYTHING. And Asa Butterfield goes through shades of emotion so minutely etched that it really is an award-worthy performance. Did I say how funny this film is? It's amazingly funny despite all this serious subject matter. But it also does move you and stay with you. I'm not sure what else one could want from a film? X+Y has a running time of 111 minutes. The movie played Toronto and London 2014. It will be released in the UK on March 13th, in Australia and Thailand on March 19th and in Sweden on April 10th.